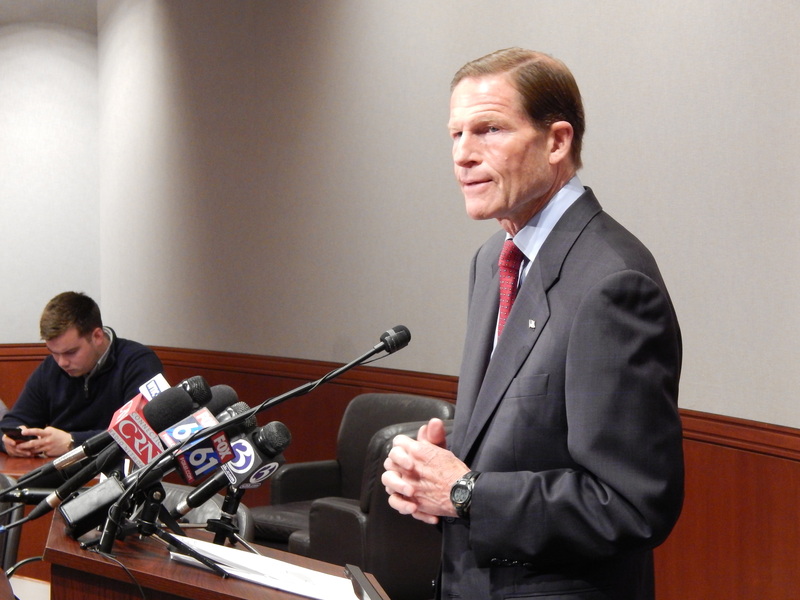 Sen. Richard Blumenthal addresses members of the media in Hartford. U.S. Sen. Richard Blumenthal, D-Conn., said if recordings of conversations between President Donald J. Trump and former FBI Director James Comey exist, Senate committees should subpoena them. “My hope is Senate committees will obtain those tapes if they exist, by subpoena or otherwise,” Blumenthal told reporters at a press conference in Hartford Friday. Blumenthal said he has “no direct knowledge” of whether the tapes exist. Trump fired Comey earlier this week amidst an FBI investigation into Russian interference in the 2016 election. Comey’s firing drew the ire of Connecticut’s entire congressional delegation. “The irony is that presidents in the past have taped conversations – Nixon among them – and I have raised the possibility that we might have another Supreme Court case like United States vs. Nixon, which resulted in those tapes being made available and public,” Blumenthal said. “I believe the Supreme Court will force disclosure of all relevant evidence, because it is certainly vital to the ongoing investigation and to the assurance of integrity in the criminal justice system,” the senator added. Blumenthal also called on Attorney General Jeff Sessions and Deputy Attorney General Rod Rosenstein to answer questions before the Senate Judiciary Committee, saying they should be subpoenaed to testify if necessary. The last 24 hours have raised “chilling facts” in the wake of Comey’s sudden firing Tuesday, Blumenthal said. He made multiple references to a New York Times report that claims Trump demanded Comey’s loyalty at a dinner shortly after his inauguration. This conversation, if true, Blumenthal said, would constitute “wildly improper” interference. He also said he has “a hard time believing” Comey would ever have given Trump assurances that he was not being investigated, as Trump has claimed. Blumenthal would not go as far as to say whether he believed the FBI’s investigation into Russian inference in the 2016 election was a motive behind Trump’s decision to fire Comey. He said it needs to be investigated. Blumenthal also was careful not to use the word “impeachment” during the press conference, which he used during an interview on CNN earlier this week.